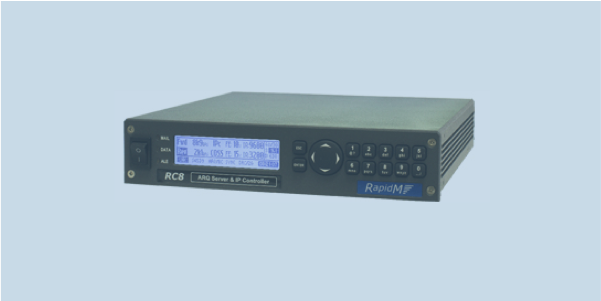 The RC8 ARQ Server & IP Controller is for Automatic Repeat reQuest (ARQ) and Vocoder functions used in maritime and strategic long-range communications. In conjunction with the RM8 Software Defined Modem (SDM) and external link encryptor, the RC8 provides robust, secure voice, data and position communication capability over HF links, even in severely degraded channels conditions. Services include voice, position transfer, Email, messaging, ACP 127 chat and IP data transfer. RC8 is capable of hosting a STANAG 5066 ARQ server for error-free data transfer. STANAG 5066 IP and COSS Clients are also embedded in the RC8. The RC8 is designed for 19-inch rack installations with all standard interfaces necessary for maritime shore and ship-borne installations. This fully integrated qualified system ensures optimal performance and functionality along with RapidM’s commitment to long- term product availability and support.